You can go back to Day 1 of this trip report if you haven’t read it already. Brent and I arose from our tents not long after sunrise, packed our gear back up, and had some breakfast. I ate a bagel with Nutella, some dried fruit, and instant coffee. We got pedaling around 8:00am, I believe about an hour earlier than our start the first day. We turned right out of the access road for the Tomahawk Creek Campground, looking for the blue markings where the High Country Pathway crossed. We didn’t see any marks before we came to Spring Lake Road, so apparently, we missed the trail. We decided to just head south on Spring Lake Road, since it paralleled the Pathway. About a mile later on this dirt and sand road, we finally picked up the trail markings again, and the Pathway actually followed this road for a short stretch. The sand got deep enough to be unrideable in one brief spot, and then turned back into the woods. 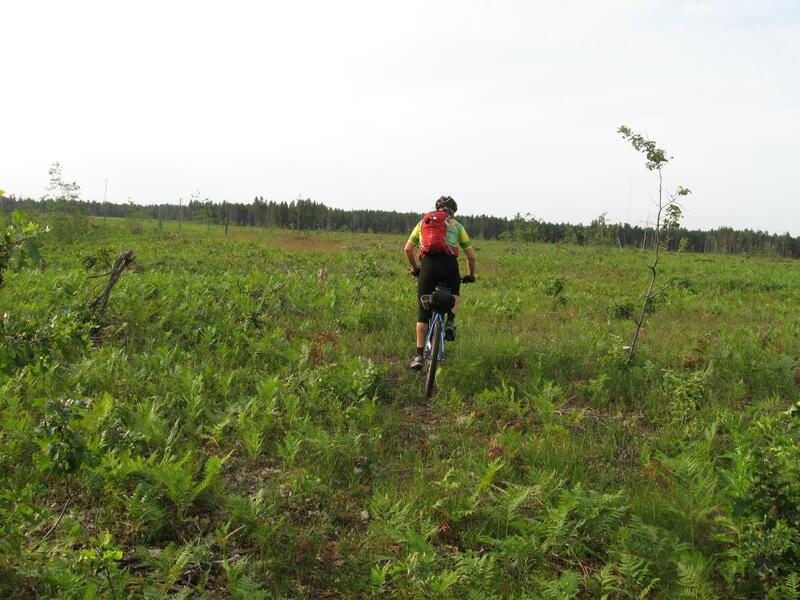 The Pathway went through one or two clearcut fields; sometimes the lack of features on these sections can make the trail even more difficult to follow. 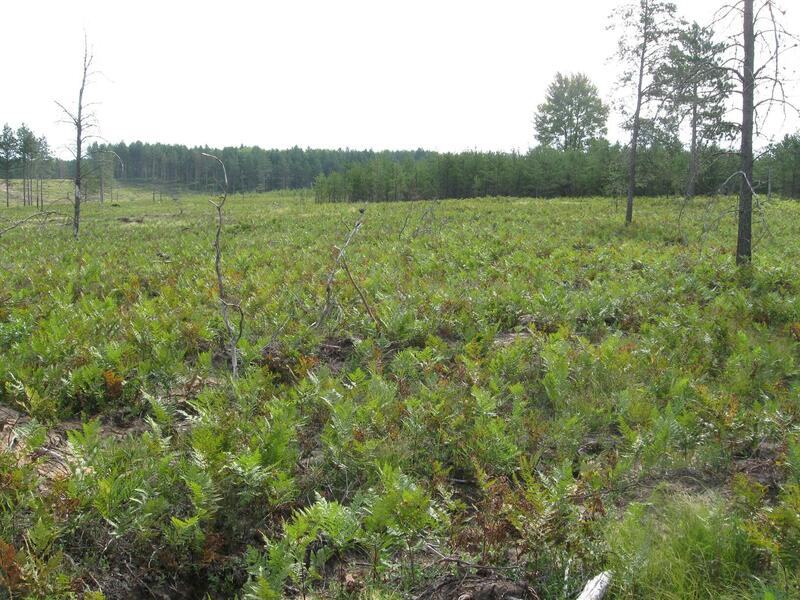 There were one or two road crossings, and we came to a section of Pathway that was the most unrideable as we had seen so far–downed logs, dirt mounds, and severe overgrowth. We could see that a dirt road more or less paralleled the trail a dozen or so yards to our left, so we bush-whacked our way over to the road and proceeded to pedal happily unfettered. Since it appeared that we’d be doing more riding out in the open today, I stopped to apply some sunscreen to my face and ears. We took out the map to see if you could figure out which road we were on, and what our next course of action should be. Many of the undeveloped roads in the area are not signed, and there are logging and maintenance roads that aren’t on the map, so it can be tricky. The rising sun was at our backs as we rode, so we figured we were heading west, more or less, and we concluded that we were on Clay Pit Road, which would lead us to State Route 33 again. This road had some long, rolling hills with some loose sand; I had to walk up one of the hills after getting bogged down in the sand at the bottom of it. We reached M-33 and turned left (south). Not long after that, we saw a sign for the junction of Clay Pit Road, so the road we were on before was actually NOT Clay Pit Road, but another unnamed, unmapped road. We ended up in the same place as we had intended, though, so no harm done. We had noticed another side road on the map called Tower Road, and off in the distance to the southeast, we could see a radio tower that appeared to be several hundred feet high, so it was obvious where Tower Road went. This section of M-33 did not have a wide shoulder like the section we rode the briefly the day before. As we rode down the right half of the lane, Brent was a little spooked by the numerous large logging trucks that zoomed past us. I guess I just didn’t think about them enough to be bothered; I was just glad to be pedaling along at a good clip. We went on for a few miles until we got to Clear Lake State Park, and turned right (west) onto County Road 622 along the south side of the lake. This paved road wound through a residential area until it turned to gravel, and then joined up with the Pathway. The Pathway soon left the gravel road and turned back into the woods. The trail finally became much more rideable again, other than one brief stretch through a low marsh area where it crossed Van Helen Creek. There were a couple of steep but do-able climbs as the trail left the creek valley, including one past the Pug Lakes area. We proceeded on the Pathway, and soon were pedaling up some switchbacks, which eventually became a steep climb straight up the fall line. I managed to keep pedaling until I reached the peak, and for a short time was proud of myself for having pedaled all the way up Rattlesnake Hill. We stopped for a while for a lunch break on the peak. I ate my last bagel with some pepperoni. It was a nice shady area, but there wasn’t much of a view, as it was blocked by surrounding trees. This is where having studied the contour lines on the map more carefully would have paid off. It turns out, we were NOT on Rattlesnake Hill. We dropped down a very nice descent from this hill, and at the very bottom, there was a small sandy patch, with a downed sapling across it, which sucked all of my momentum. As the trail immediately turned steeply upward again, it was at this point that we realized that THIS was Rattlesnake Hill. I didn’t have the energy nor the will to attempt to pedal all the way again, so I stepped off the bike and trudged up sheepishly. There is a bench at the top of Rattlesnake Hill, and the view is much more memorable. It is much more open and exposed to the sun, however, so at least I was comforted in believing that at least the “false” Rattlesnake Hill was a better place to stop for lunch. The descent off of Rattlesnake Hill was a little rough; it looked like the trail had recently been re-routed, and the new trail was not yet very well-established. I didn’t bomb down, but just took it easy to stay in one piece. Not long after that, the Pathway re-joined County Road 622. We decided we had enough trail experience for a while, and stayed on the road to try to cover a big stretch of ground more quickly. 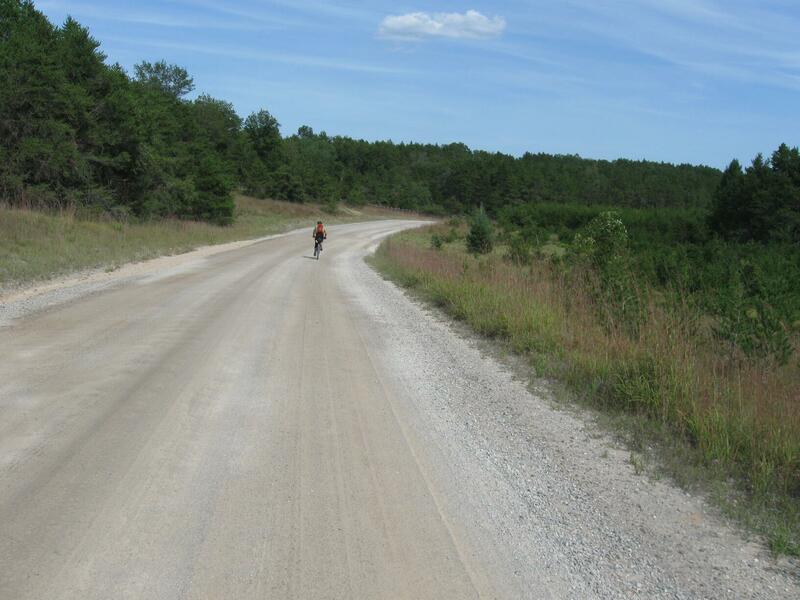 The road was the usual dirt, gravel, and sand. 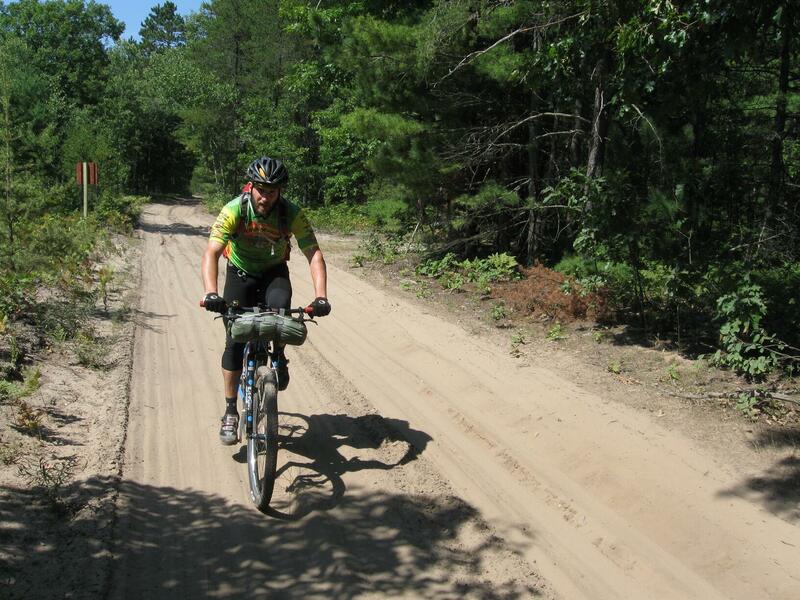 The sand was a little thick in spots, but never so much so that we couldn’t keep pedaling. It felt good to be pedaling along at a good, steady pace, but it was hotter out on the open road, and the sun reflected off of the sand, making me fell like I was getting double exposure. County Road 622 ends at Black River Road, which we took north until it intersected the Pathway again. There were a handful of residential houses on both roads; the people in them must really enjoy living off the beaten path. We headed back west on Chandler Dam Road until it ended at Tin Shanty Road. We intended to follow this north until it crossed Sturgeon Valley Road, but again, with scant road signage, we ended up going all the way to Hardwood Lake Road. This goes west until it joins Twin Lakes Road, which shortly brought us to the park headquarters and our car, for a total of 40 miles ridden for the day. We enjoyed an impromptu post-tour celebration. Despite the couple of minor unplanned detours that we had, navigation of the Pathway is pretty straightforward. A GPS and/or compass may have helped a little, but the average person should be able to find their way around the Pathway using the map and common sense. We were amazed that we suffered no flat tires, especially after having ridden (or pushed) through so many overgrown weeds, many of which were thorny branches. However, I later found at home the next day that both of my tires were flat, so that would have been something to deal with had I been on the trail a third day. 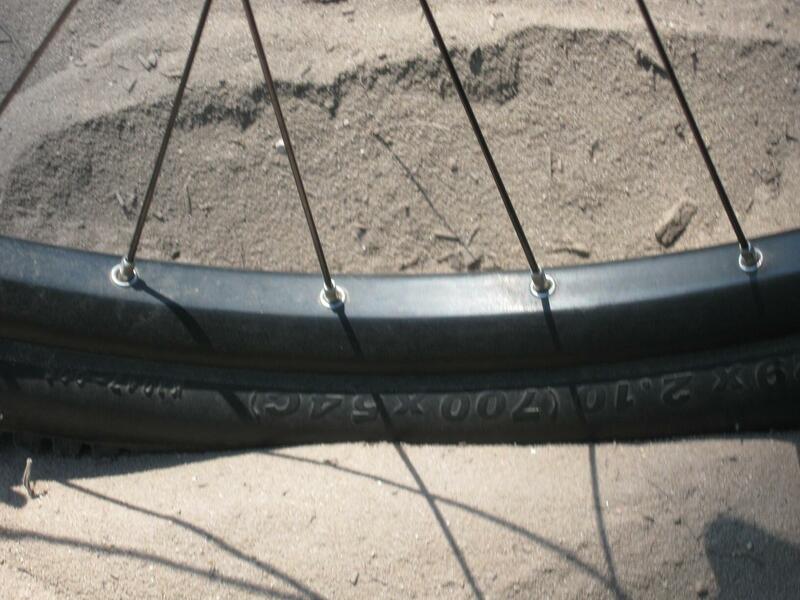 I would recommend either tire liners, sealant, tubeless systems, or whatever your preferred combination of puncture-protection technologies is. 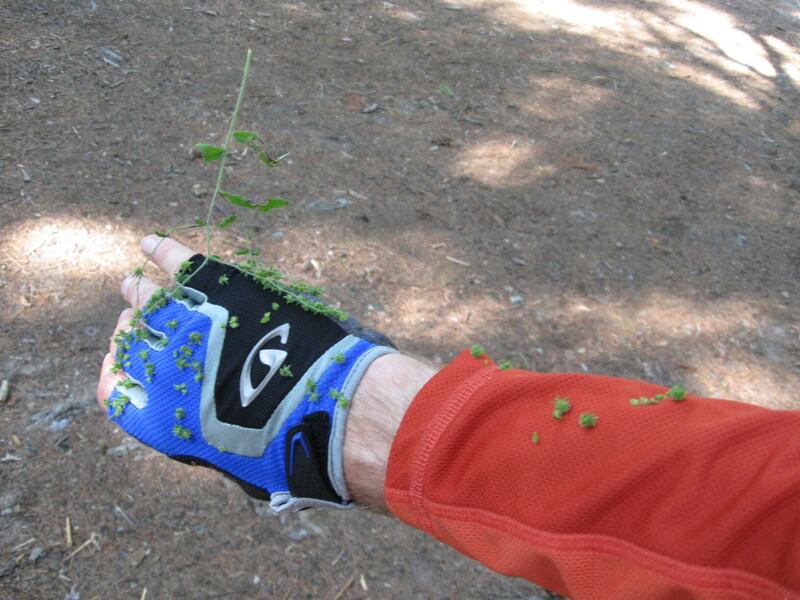 Similarly, we were amazed that neither of us suffered poison ivy; not long into the first day, we gave up trying to avoid it as we pedaled through the weeds. To avoid both the poison ivy and just plain being cut up by the weeds, I’d recommend long sleeves and some type of long pants or tights. As I mentioned before, the insects were not as bad as we had feared, but the dry weather may have given us better than typical luck in this regard. Because of the rough and less-developed nature of the trail surface, a full-suspension bike would be ideal for traveling the Pathway most efficiently. However, I am still quite happy with the performance of my rigid Salsa Fargo, and wouldn’t hesitate to keep using it for other similar adventures. There are couple of things that I learned from this trip that might influence further refining of my bike-packing setup (see Day 1 for the details). The slight changes I made to my cooking and eating gear for this trip really helped create the extra space I needed for food in the frame bag. Eliminating a lot of extra clothing saved me both space and weight on this trip, but I’ll still need to account for that on a longer trip through more varied weather, such as the Great Divide. I found that I really didn’t need all of the snacks and personal care items so close at hand in the top tube bag. That stuff could have easily gone in my backpack, and for the times that I needed it, it would not have been that big a deal to retrieve it from the backpack. Maybe I can find a way to better utilize this space. The only issue I had, and it was quite a minor one, was with the two zip-lock bags containing my tools and spare parts. During the first day, I had them in the front of the seat bag, with my sleeping bag and sleeping pad in the back of the seat bag. The irregular size and shape of the tools and spare parts left voids in the space between them and the sleeping bag and pad, causing the bag to sag a bit. On the second day, I put the sleeping bag and pad in first in the front of the seat bag, and then the tools and spare parts in the back. But, this put the heavier items more towards the back of the bag, so it still sagged more than usual and I had to stop and re-cinch the straps a few times throughout the day. Maybe I can distribute the tools and spare parts between the top tube bag and frame bag, or maybe put them in the handlebar bag, and use the top tube bag for my smartphone and digital camera. Either way, it’s a good excuse to continue planning short adventures to work these things out. 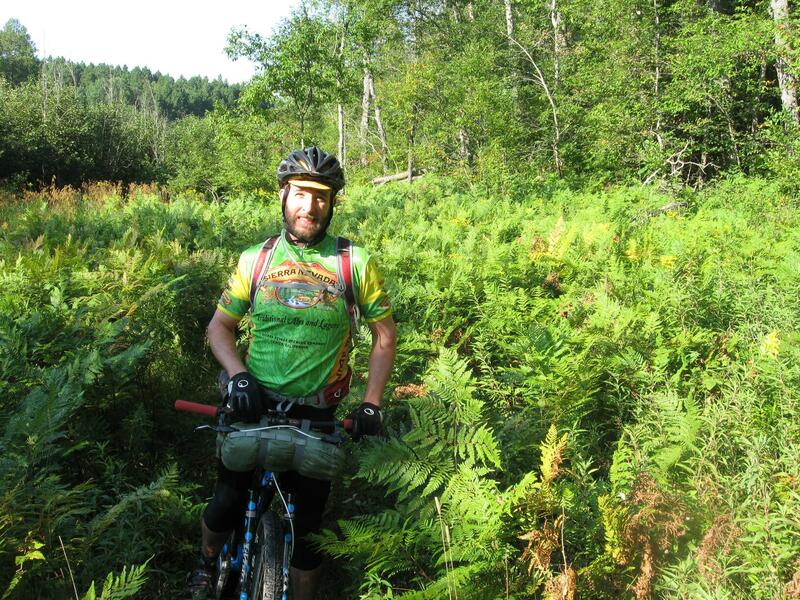 My friend Brent and I are planning to ride the Great Divide Mountain Bike Route in 2014. We wanted to do a short tour to test out our bikes and gear, as well as our mettle in handling a multi-day off-road adventure. 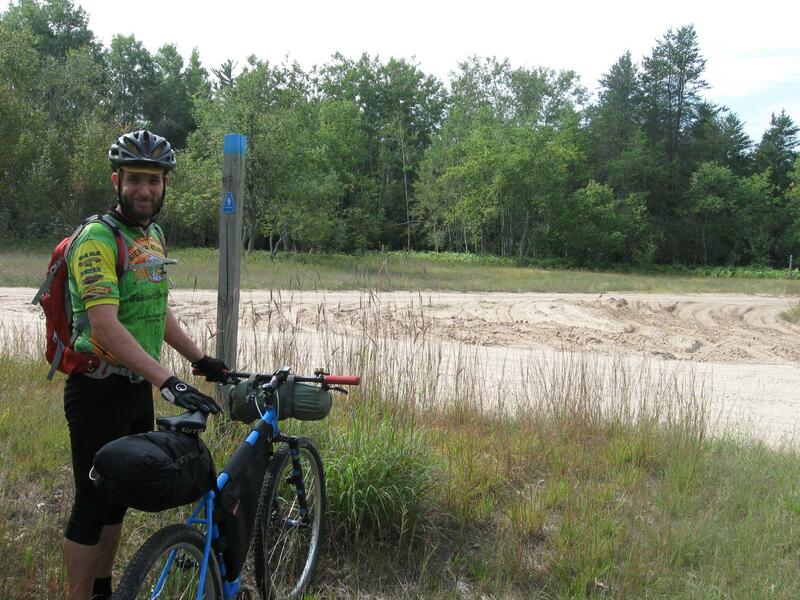 We selected the High Country Pathway, located in the northern reaches of the Michigan lower peninsula, because it is within a reasonable drive, and we figured we could handle the 80-mile loop in two days. 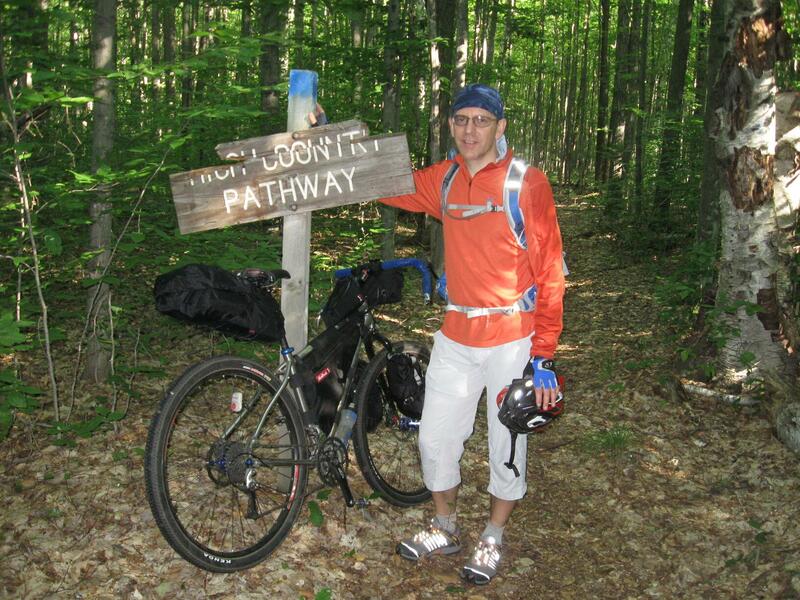 The High Country Pathway is open to hikers, mountain bikers, and cross-country skiers. 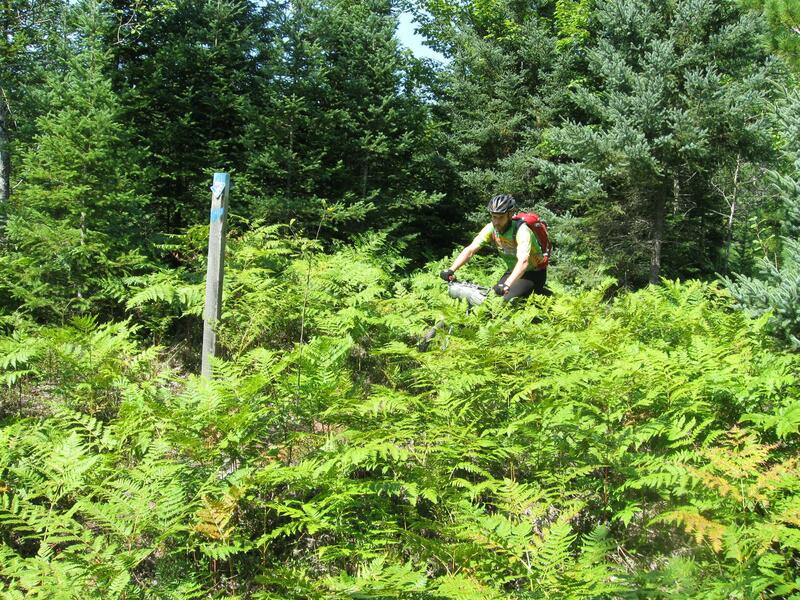 There are also equestrian and snowmobile trails in the region that intersect it. 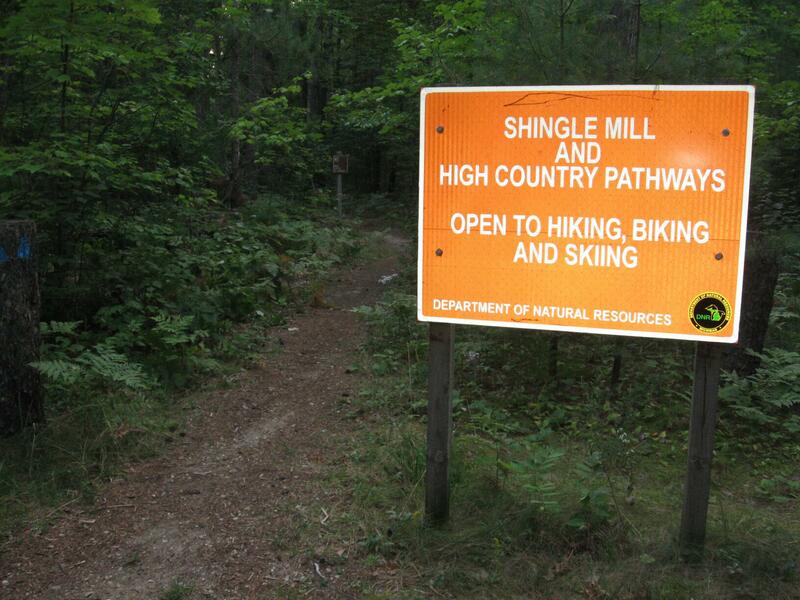 We referred to the trail using the abbreviation “HCP,” but locals and the trail signage refer to it as simply the “Pathway.” It spans a four-county area, mostly within the Pigeon River Country State Forest. You can order a map of the Pathway, printed on quality waterproof and tear-resistant paper, from the Pigeon River Country Association (please let me know if any links become dead). Despite the remoteness of most of the Pathway, it’s easy to get to where you can begin your adventure. The nearest town is Vanderbilt, just off Interstate 75. Turn east on Main Street, and as you leave town, the road becomes Sturgeon Valley Road. The park headquarters is a few miles away, just up Twin Lakes Road on the left. After a detour along the way to ride the singletrack at Fort Custer State Recreation Area, lunch and dinner stops, we arrived after dark. We set up camp at the Pigeon Bridge Campground, the camping area just before the park headquarters. There are several such campgrounds along the Pathway to provide starting and stopover points. There are no showers or electrical hookups, but there are toilets, fire rings, and wells with clean drinking water. 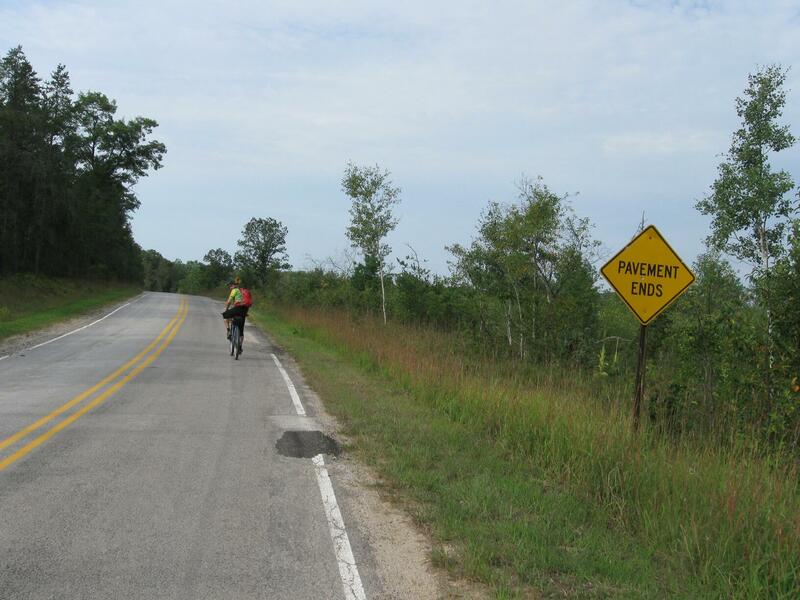 Although, it turns out we would not end up riding this particular stretch. Checking in at the campgrounds is done on a self-registration system; only cash and checks are accepted, so remember to have some small bills on hand for correct change. As of this writing, the fee is $13 per campsite per night. 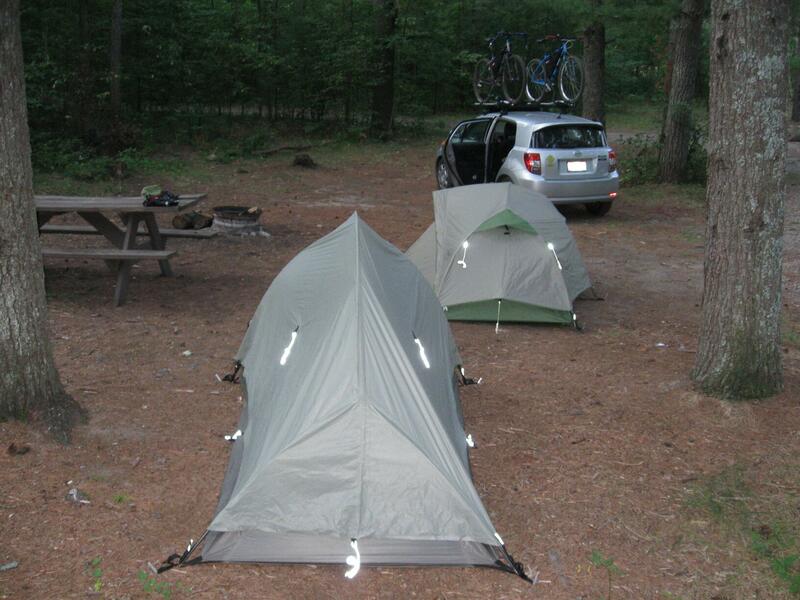 In addition to camping fees, you’ll need to buy a state parks recreation pass to bring a vehicle into any Michigan state park or recreation area. You can buy one at any state park office for $8 per day or $29 per calendar year (for non-residents). Michigan residents can purchase passes when they renew their driver’s licenses. I’m guessing non-residents can order them by mail or online, but I could never locate that information on the Michigan Department of Natural Resources web site. There was one other site occupied, by a couple in an RV. They were running a generator, which broke the silence of the otherwise isolated area, but fortunately, it didn’t run continuously, and most of the evening was spent in quiet. We hit the sack in our tents. It had been warm most of the day, and remained relatively warm through the first part of the evening. I slept inside my sleeping bag in my shorts and t-shirt, until I woke up in the middle of the night feeling pretty cold. I got my sweatshirt out of the car, and slept comfortably again for the remainder of the evening. In the morning, while we re-packed our tents and sleeping gear, the gentleman from the RV stopped over to say Hi and get some water from the well. He said he’d be making a pot of coffee, and apologized if his generator was disturbing. “Gotta have it for my coffee,” he said, “So I figured it was only fair if I offered some.” After I ate a bagel with Nutella for breakfast, I took my travel mug and wandered over to the RV to partake. We chatted a bit; his name was Philip, and he was from Traverse City. The women with him was actually his sister; he said he brought her out to “give her a break from her kids for a couple of days.” They planned to do some fishing later in the day. Brent and I weren’t sure if the best course was to leave our car there at the campground, or move it somewhere else while we were out on the trail. So, we loaded our stuff back into the car, and drove up the road a bit to the park headquarters. There’s a small trail parking area right next to the headquarters building, so we decided to use that. Brent had forgotten the car charger for his mobile phone, so it was pretty much dead at this point. He asked if he could plug in for a few minutes at the ranger station, and the ranger generously agreed. It took about 30-40 minutes for us to get our bikes set up and change into our cycling clothes, and by that time, he had a decent 40-50% charge. I had noticed the night before that my cell coverage dropped off as we left Vanderbilt, but we thought we might get occasional coverage on high ground, and he wanted to be ready to check in with his wife once in a while when possible. In our research about the Pathway, we had read that the mosquitoes, deer ticks (carriers of Lyme disease), and other insects were particularly nasty. Brent bought some 100% Deet insect repellent; I stuck with the more innocuous Deet-free Natrapel that I already had. I applied some to the exposed area of my lower legs. Since I figured we’d be riding under tree cover for most of the day, I didn’t bother applying any sunscreen. We finally started pedaling, some time around 9:30am if memory serves, but we weren’t really watching the clock. We joined the Pathway immediately in front of the park office. 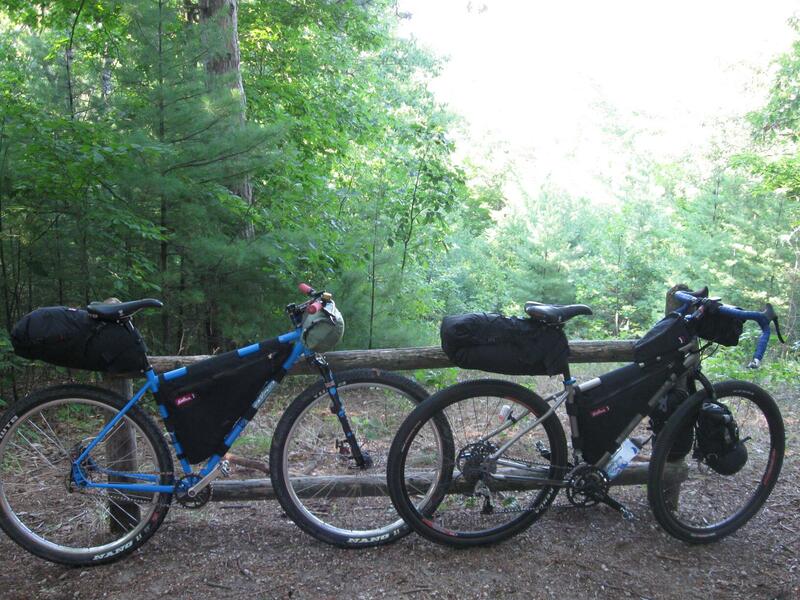 We passed a couple of backpackers almost immediately, and then rode through the Pigeon River Campground, which is located along the Pathway just northeast of the park office. The terrain of the Pathway was mildly rolling; the climbs were not extreme. The route of the Pathway was easy to follow, marked with blue blazes painted or nailed onto trees or sign posts. The surface was pretty solid dirt most of the time, but it seemed that it didn’t get enough traffic to pack it down smoothly. 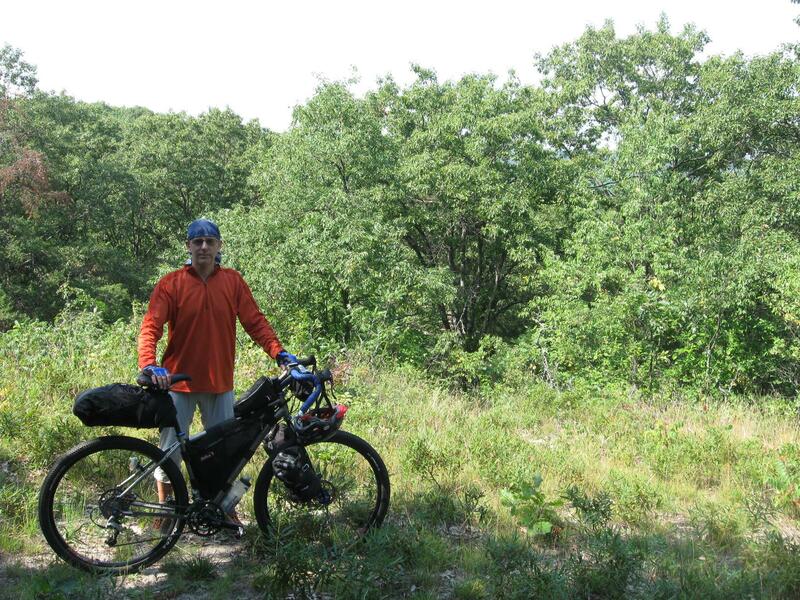 To a hiker, it would seem perfectly fine, but our rigid bikes felt every minor bump and trough. At times, the path through the woods would be fairly wide open, but much of it was very overgrown with weeds. This made riding cumbersome sometimes, as it felt like we were continually bushwacking to find and follow the path of the trail. The weeds, often thorn bushes, slapped against our legs, leaving them looking like we had been attacked by feral cats. I wore long sleeves mainly to keep the sun off of my arms, and this gave me the added benefit of keeping the weeds off of my arms. Brent, in short sleeves, was not so lucky. Our first major break came about 4-1/2 miles in, on top of a hill overlooking Grass Lake, although with the tree cover, the lake itself was not visible. We took some pictures and rested a bit, marveling at our so-far slower-than expected progress. About 5-1/2 miles in, we came to the first of only a handful of significantly steep climbs. I’m no expert at reading maps with contour lines, but I could see ahead of time that the “Devil’s Soup Bowl” would turn out to be an apt name. There was a steep, fast downhill, then the trail immediately turned steeply upward to get out of the bowl. I was able to grind it out in the granny gear on my Salsa Fargo bike, but Brent, on his singlespeed El Mariachi, had to push it up. The Pathway continued for several miles with more of the same as before–some wide trail, some overgrown, mild ups and downs. We came across another trail feature that would bedevil us for the rest of the trip. 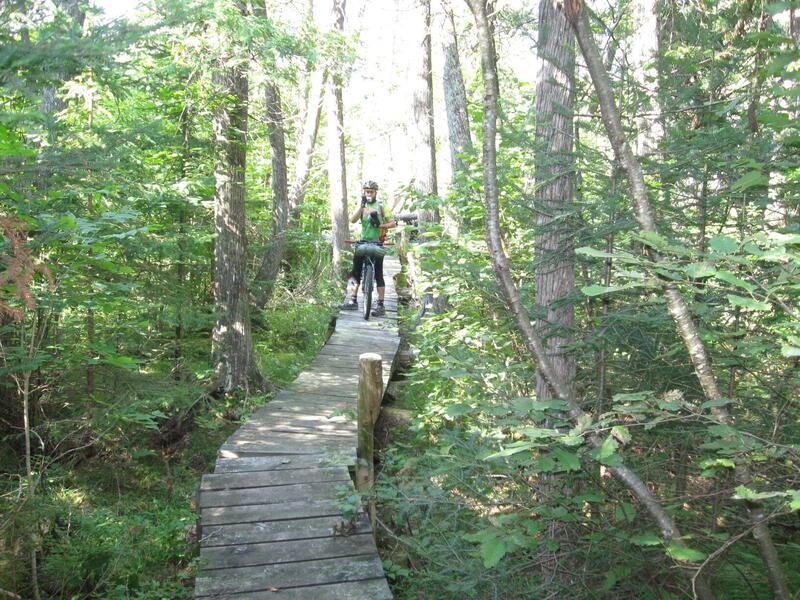 In some low, marshy areas, wooden bridges were built to provide solid footing over the soft, muddy ground. For a hiker, again, this would be no problem, but the bridges are usually too narrow to risk trying to ride across (unless you’ve got mad trials riding skills), and also makes it very tricky to push your bike across. A bike loaded for touring is too heavy to carry for very long. 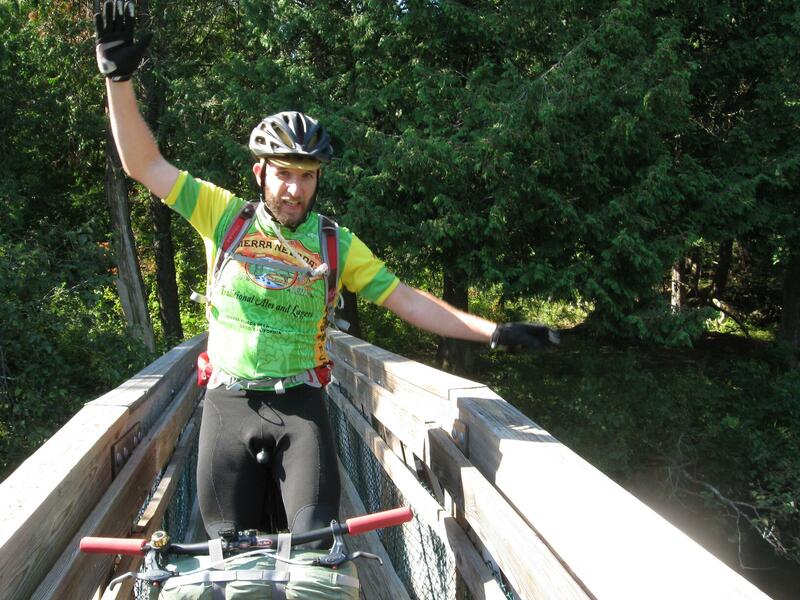 I usually put the front wheel in front of me on the bridge, and held my bike so the back wheel swung out beside me over the edge of the bridge. This was tricky as well, because often the weeds were as overgrown on the bridges as they were on the other parts of the trail. Sometimes I would tilt my bike up vertically, so that I could hold the handlebars in front of me and roll it on the rear wheel as I pushed it from behind, but it got heavy after a while in this mode. About 9-1/2 miles in, we stopped at the Pine Grove Campground to top off our hydration packs and take another short break. I’ll take this opportunity now to list my gear and packing setup. 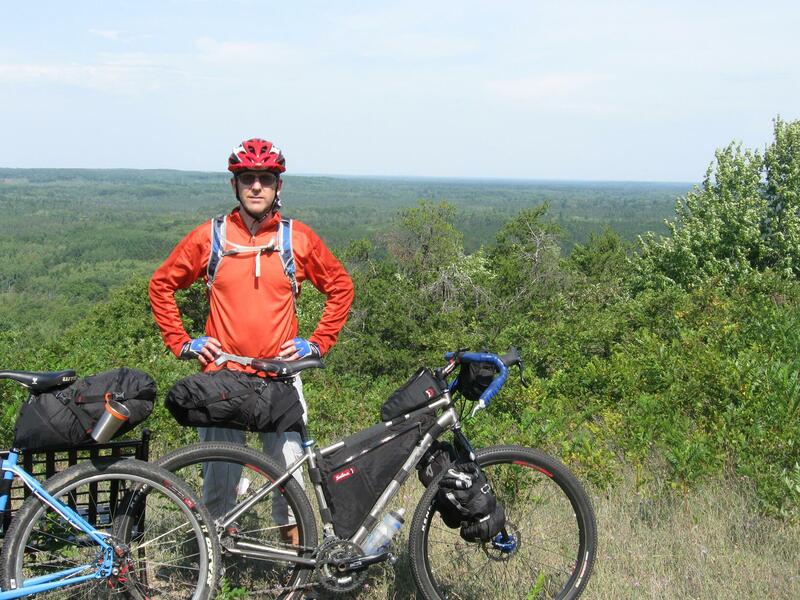 What I used was a more pared-down version, with some refinements to the cooking/eating gear, of the bikepacking setup I first used on a sub 24-hour overnight last month. 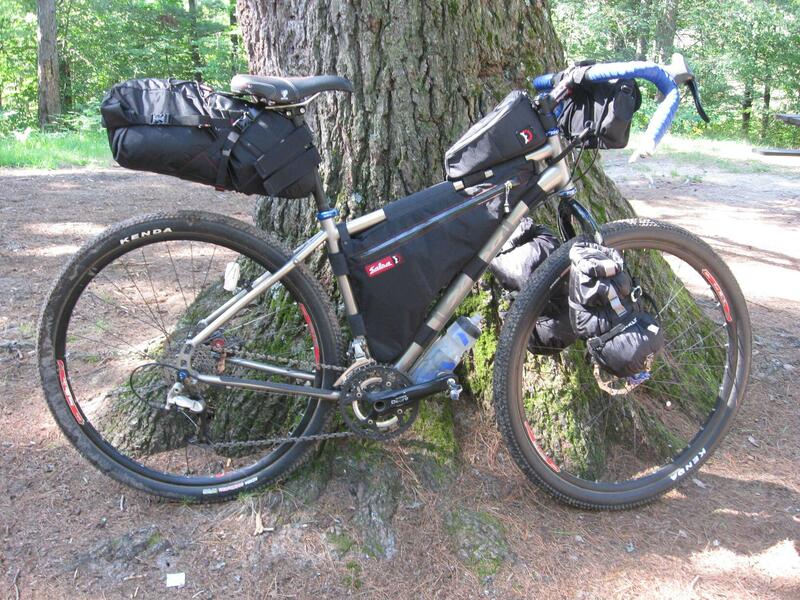 I didn’t get the opportunity to weigh the complete setup, but I suspect it was just a few ounces less than the full bike-packing gear setup that I broke down in an earlier post. It probably came to about 24 pounds, including the bags themselves, on a bike that comes in around 27-1/2 pounds. 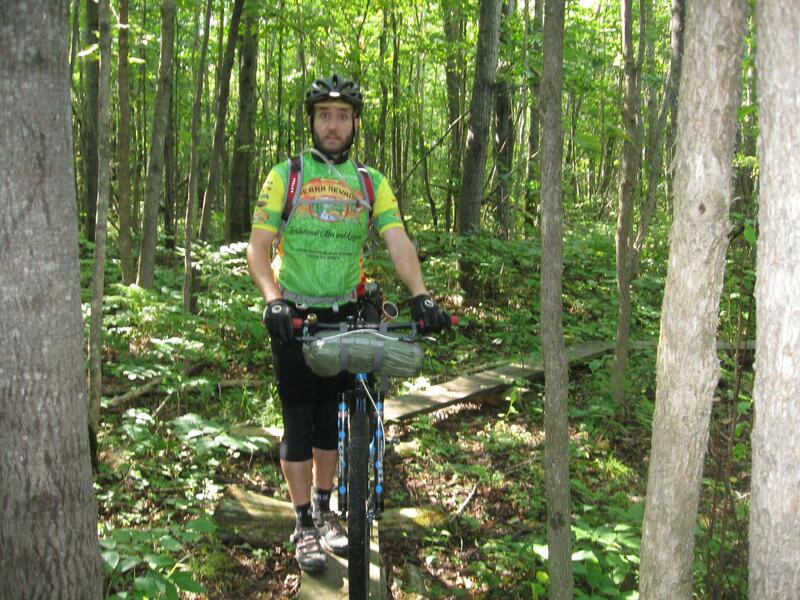 The handlebar bag was a last-minute decision, because I figured I wanted to have the trail map and my digital camera close at hand at all times. I had planned to add a cable lock somewhere in the mix, but that ended up being the one item that I inevitably forgot. I also added a bottle cage to the mount on the bottom of the down tube, just so I’d have a bottle that I could use to mix up a sports drink along the trail using one of the electrolyte tablets. The MRE had been given to me by a friend about nine years ago; I figured this was a good opportunity to finally try it out. The tuna and potatoes were a backup in case the MRE didn’t fare so well. I did not end up needing any of the cold- and wet-weather clothing in the one stuff sack, but it was all fairly light, and I felt better knowing that I had it in case I did need it. 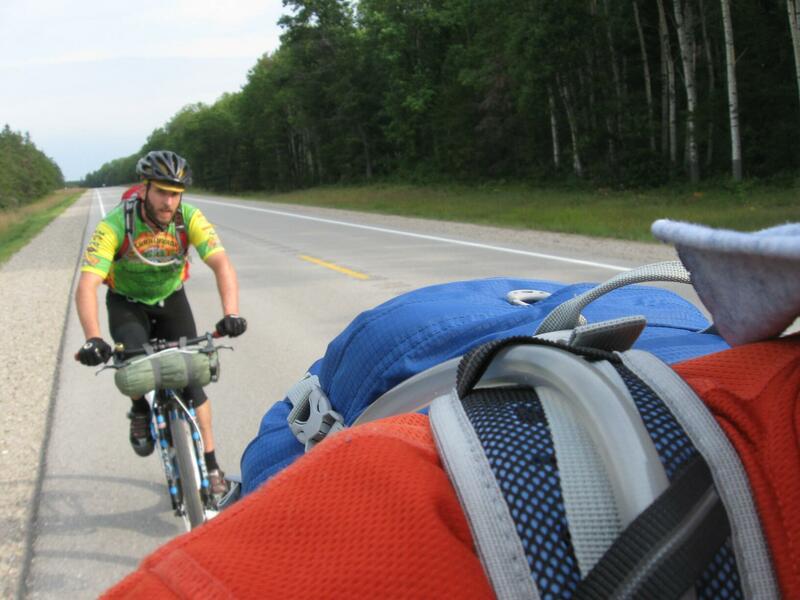 I usually like to pack a pair of non-cycling shoes or sandals when I’m bike touring. No matter how comfortable my cycling shoes are, it always feels good to have something different to change into for walking around camp in the evening. To save space, however, and since it would only be for one night, I decided to let my feet rough it for this trip. I felt like the Salsa Fargo handled well on the off-road terrain while carrying all of this gear. I was a lot more tentative than I would be compared to riding singletrack on an unloaded bike, just for the fear that something is bound to come loose if given the opportunity. But, during the few times that I did “let it all hang out” on some fast sections, the gear was none the worse for wear. We decided to stop for lunch around the 12-mile mark. There was no distinguishing landmark at this point, other than a fallen log beside the trail that provided a convenient place to sit. I ate a bagel with Nutella, some pepperoni slices, trail mix, and dried fruit. Around the 15-mile mark, the trail crosses Osmun Road, and here we encountered our first navigational error. Maybe where the trail continues was not marked clearly enough, or maybe we just didn’t look carefully enough, but we thought the trail continued along the road, so that’s the way we went. 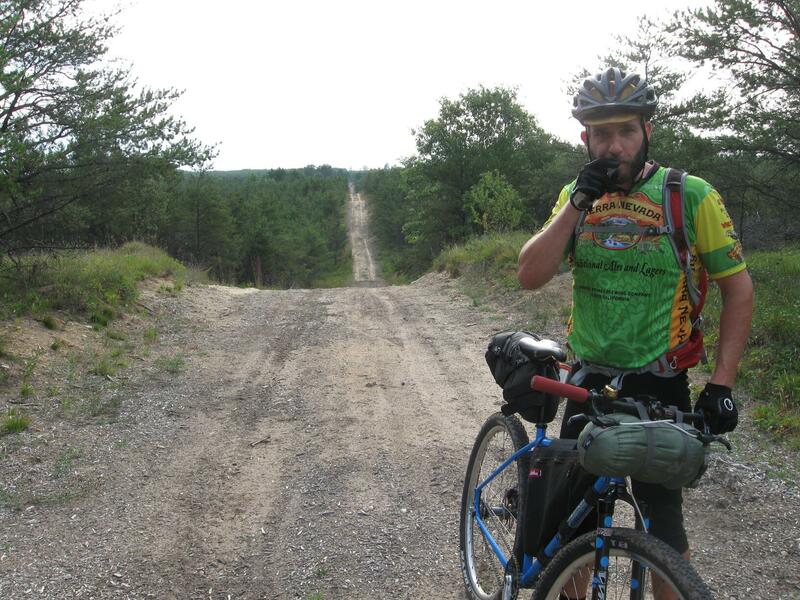 The road surface became very loose sand, making pedaling tough sometimes, but not quite to the point that we had to dismount and push. We called out “Mukluk!” on these sandy stretches, continuing the tradition that we started on the trails at Fort Custer State Recreation Area the day before. We continued for a few miles, until, after not seeing any of the blue blazes for the Pathway, and presented with an unmarked fork in the road, we realized we must not be on the right track. We consulted the map, and after discussion, determined to take the right fork. This turned out to be the correct choice. 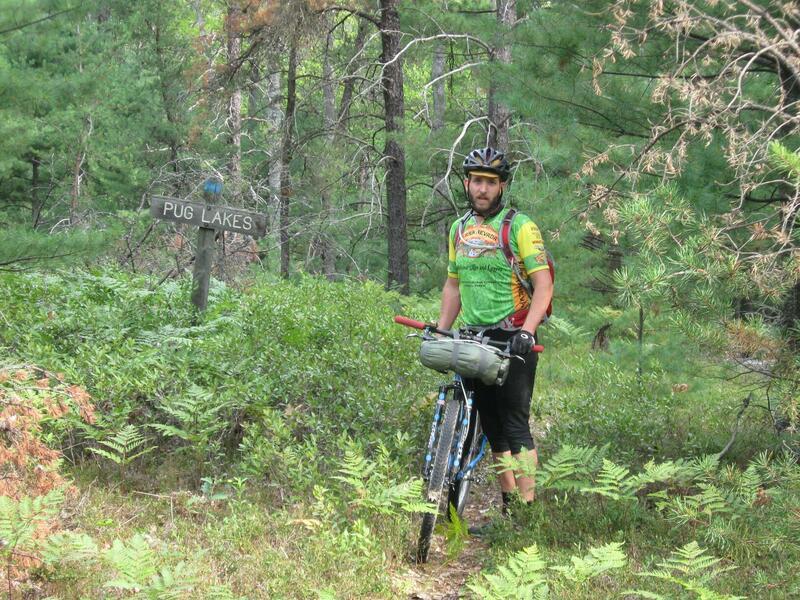 It turns out, we had been riding on Duby Lake Road, and we crossed a junction with the Pathway shortly thereafter. A short time after re-joining the Pathway, we crossed the intersection for the trail spurs to Duby Lake and McLavey Lake, confirming that were were once again on the right track. The Pathway continued much as I’ve already described–some wide-open trail, much more overgrown trail, gently rolling terrain interspersed with some short, steep climbs, and more of the narrow wooden bridges. There were a couple of areas where the Pathway crossed an open field. One in particular looked very surreal, with tall, strange-looking weeds with groups of bulbous green seeds on top; we dubbed it the “Land That Time Forgot” because of its prehistoric-looking nature. Sorry; I didn’t think to stop for a picture here. We planned to stop for another snack break at the Canada Creek Shelter, which would have put us at the 33-mile mark for the day, out of an expected 40 miles to the Tomahawk Creek Campground. The Pathway crossed County Road 634, where we saw a sign that there was a bridge out where the Pathway crosses over the actual Canada Creek, and it advised to follow the posted detour south on 634 (a dirt and gravel road). We were getting pretty tired and hungry again, and in hindsight, we probably should have stopped here or even sooner for another break, but we decided to press on to finish the day’s ride as soon as possible. The detour along County Road 634 dead-ended on Canada Creek Highway, another dirt and gravel road, where we turned left (east). The Pathway markers indicated that we could have picked up the trail again somewhere just before State Route 33, but we checked out the map and decided to take the most direct route to the campground. We turned right (south) onto Route 33, and less than a half-mile down the road, turned left onto the dirt and gravel Tomahawk Lake Highway, which led to the campground. 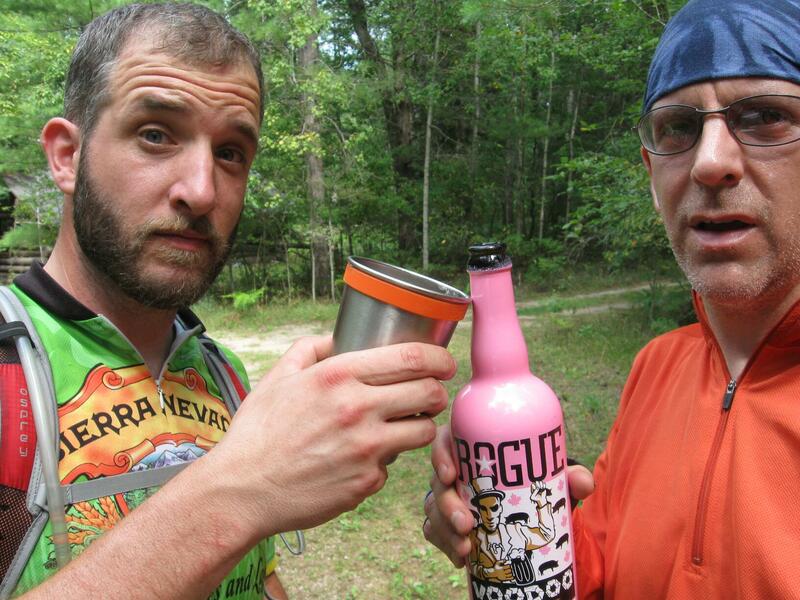 We had logged a total of 37 miles for the day, but it had felt like double that. We did the usual self-check-in at the camp site. 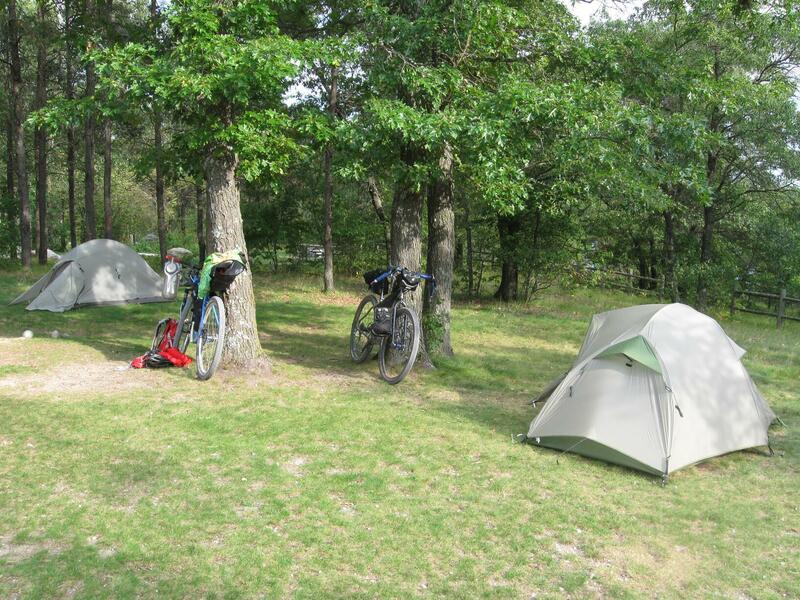 There were only two other sites occupied that we could see, and the sites were quite spacious, which afforded the quiet and solitude that most bike-campers would hope for. I took my socks off, and clicked the liner out of my shorts and changed into the boxers; with the outer shorts and the jersey, that’s what I ate and slept in for the night. We ate our dinners at the campsite picnic table. My MRE turned out to be surprisingly good; an added bonus that I wasn’t aware of until I opened it up was the self-contained chemical heating unit. I saved the instant coffee for the morning. 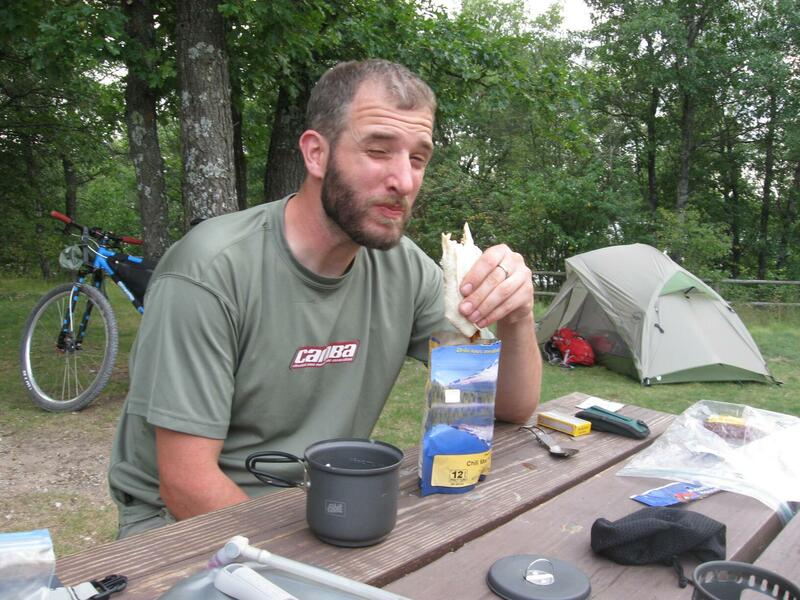 Brent had an instant backpacker’s meal of beef chili, plus some of the tortillas and sausage that he had brought. I heard a few mosquitoes buzzing around my ears throughout the evening, but they weren’t nearly as bad as we had expected from our pre-trip research. We never felt like we needed our head nets. Horse flies were attacking my ankles, so I applied a little more Natrapel to that area (formerly protected by my socks), and that did the trick. I’m sure that the bug population varies with the time of year and the weather, and the very dry summer that we’ve been having here in the Midwest probably helped with that. We turned into our tents while it was still light out, and had no trouble falling asleep. We heard a storm rolling through during the night, but we weren’t sure how long it lasted. Our tents held up well and we stayed dry, and I was comfortable temperature-wise the whole evening.